How can you talk about a topic so complicated and deep as death in a children's book and make it relevant, without being overpowering? 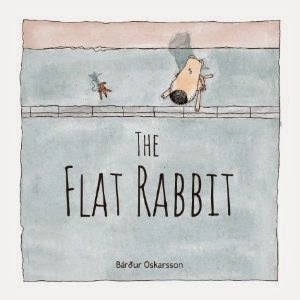 Bardur Oskarsson has found a way in his new thought-provoking book The Flat Rabbit. And, he does it with such a innocent simplicity that's absolutely brilliant. A dog and a rat meet on a sidewalk and find a rabbit lying flat on the road. Without stating the obvious, the author proceeds to lay out a dilemma for the two strangers. What do you do with a flat rabbit? Moved by compassion, the one thing the strangers agree upon is that it can't just be fun to lie there. The rabbit must be moved. But how? And to where? Therein lies the crux of the problem. By embodying the dog and rat with such a complex issue to solve, Bardur Oskarsson beautifully introduces the concept of respect and problem solving to the little ones. After much contemplation, the dog comes up with an inspired, and unique idea. The two strangers then proceed to work diligently together to make it happen. Note how Bardur Oskarsson seamlessly introduces the concept of teamwork and doing the right thing into the equation. Even though they are not one hundred percent sure their idea will work, they don't give up on their mission to help get the rabbit to a happier place than the middle of there road where they originally found her. They work all night on their plan. Once finished, they do their best to give a better "life" to the rabbit. The story is a wonderful introduction for kids about the idea of death...without getting too gruesome (you'd think roadkill would be just that). But the simplicity of the illustrations are delightful and at times poke a gentle humour at the situation. With so many levels of meaning and understanding, The Flat Rabbit is a great foundation for parents and teachers to expose kids to bigger themes. The Flat Rabbit is a smart story with heart, told in an unusual but thoughtful way, an approach that will teach kids about the power of right -- doing the respectful thing and caring for another individual. The Flat Rabbit is published by OwlKids Books Inc.